The latest from TD Garden on Friday, May 19. Honestly, it was just 86-42 and there were a good number of fans chanting "Let's go Celtics." I respect the dedication. Ty Lue may want to get LeBron, Kyrie and Love out for good, turning into a bad pickup game. CLE 86, BOS 42. LeGarrette Blount still here supporting his guys even though he's an Eagle now. Missed this a minute ago, but the Celtics say Isaiah is out for the rest of the night with a hip strain. If the Celtics outscored them 71-31 in the second half, they'd lose by a point. Celts will decide at halftime if their congressional hearing will be closed or open to the public. Word from Manhattan: Celts-Cavs score has blown out elias computers. This is Globetrotter-like. Minus the laughs and the bucket of confetti. 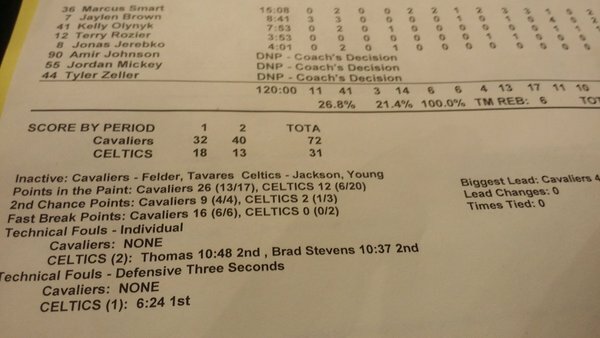 Cavs 72, Celtics 31. Halftime. Halftime: #Cavaliers 72, #Celtics 31. Yeah, that's about it. The Cavs are significantly better than the Celtics. James Jones might play 20 minutes in this game and I'm not even sure they give him a uniform anymore. If Red were still with us, Cavs would need hazmat suits to enter dressing room at halftime. Tyronn Lue’s pre-game speech was probably just reading the NBA press release that LeBron wasn’t a finalist for MVP. The Cavs have more made 3s (nine) than the Celtics have made shots (eight). If the Cavs lead reaches 50, the leprechaun plays. Barefoot. #Cavaliers outscoring the #Celtics 29-6 in the 2Q. It's now 61-24 #Cavaliers . The Celtics are 2 of 9 from 3. Gerald Green has both of them. Note to Cavs: even if you win by 100, Celts still get to keep first pick, ok? Who scores a basket first, IT or Horford? And will it happen before Sunday? #Celtics are having their spirit and will taken from them. #Cavaliers are enjoying the process. Classy by the Cavs, almost entire bench standing and clapping for "Hero Among Us" honoree, soldier who lost leg in IED explosion. It's 50-22 #Cavaliers . #Celtics have nothing left. Terrible way to end the season. What if Kyle Korver was actually making 3s in this series would they just cancel it? Now a technical foul on Brad Stevens. Must really be getting real out there.